Wildlife such as hippo, buffalo, crocodiles, rhino, elephant and lion roam around the Zambezi Valley. Mana Pools is a well known park where there is a wide variety of game, and game walks and drives are very popular in this park. Canoe Safaris are one of the best in Southern Africa, and is the ideal way to get up close to the animals and nature.The Zambezi Valley stretches from Victoria Falls in the east, and then flows into Lake Kariba from there it goes into the Middle Zambezi which is famous for its fishing, especially tiger, and wildlife. 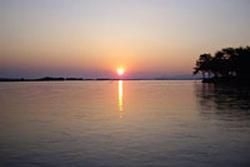 There are many camps along the banks of the Zambezi River which give you the ideal opportunity to catch tiger fish whilst viewing the game as well.